Deep Silver's new RPG is the latest addition to the on-disc DLC parade. "On-disc DLC" should be a fairly self-explanatory concept but for the benefit of the thick-headed kids in the back, it's basically content that the publisher offers to gamers post-release and at an extra cost, but which is in fact already on the game disc. Capcom took a lot of grief for including locked-out content with the retail release of Street Fighter X Tekken, as did BioWare, which included everything but the voice files for Mass Effect 3 DLC From Ashes. 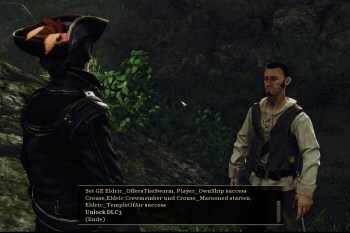 Now it's Deep Silver's turn, as our very own Dexter111 recently discovered that both the Treasure Isle and A Pirate's Clothes launch-day DLC are actually included on the game disc. The only thing that appears to be missing is the spoken dialog, which is downloaded when the DLC is purchased. The extra content can even be activated, albeit without the voice files, by enabling the game's "test mode" and then using three "spawn" commands. The news that this day-one DLC is already included with the game hasn't made a lot of gamers terribly happy, particularly those who were already annoyed by the very existence of the DLC in the first place. For critics who say that launch-day DLC is merely game content that's cut out and held back for more money, the last-minute announcement of the DLC coupled with its barely-separate inclusion on the game disc must come off as a particularly egregious money grab. Deep Silver has not yet commented on the matter.